But much of the media buzz, particularly in the talk show universe, revolved around the week’s No. 3 story—Sarah Palin’s book tour—which to some degree inevitably turned into a referendum on the press itself. Coverage of Palin often seems to end up with the news media’s behavior near the center of the narrative. And that was the case last week as media vetting of “Going Rogue” and her complaints about a Newsweek cover photo became issues in their own right. From November 16-22, health care reform was the No. 1 story, accounting for 13% of the newshole according to the Pew Research Center’s Project for Excellence in Journalism. The Saturday, November 21, vote to bring legislation to the Senate floor for debate—a significant, but far from decisive milestone—occurred too late in the week to have a major impact on this News Coverage Index. The U.S. economy was the second-biggest story (at 12%), amid more mixed signals about the unemployment picture. The fifth-biggest story (at 5%) was coverage of President Obama’s trip to Asia, some of which questioned whether he had achieved any substantive results. And after two weeks of dominating the news, the Fort Hood shooting receded from the headlines last week. Even as Congress began hearings on the rampage, the story accounted for only 4% of the coverage, down from 20% the previous week. And the views of Palin that emerged in the media narrative last week were widely divergent and often strident. One focus of the coverage was a challenge to the accuracy of some passages in her book. The Associated Press published a story headlined “Palin’s book goes rogue on some facts.” The story suggested that she had misrepresented her role in several public policy issues in Alaska, such as the development of a natural gas pipeline and the settlement in the Exxon Valdez case. Liberal MSNBC host Keith Olbermann ham mered away at that theme on his November 17 show. “The Sarah Palin dishonesty tracking center [is] working overtime…to her credit, the lies display no partisan bias. She lies to the right wing and mainstream alike,” he declared. From the other side of the political spectrum came spirited defenses of Palin and attacks on the press. On his November 16 radio program, Rush Limbaugh asserted that the “state-controlled media…are going bonkers over Sarah Palin and her book” and singled out the AP’s story. The week’s No. 1 story, the battle over health care, was the top subject in two sectors last week—radio (19% of the airtime studied) and cable (18%). In mid-week, the big event was the unveiling of the Senate health care measure. Some of the coverage noted that the Senate bill—reported to cost about $850 billion, to cut the deficit by about $127 billion in the next decade and to cover up to 94% of Americans—would face some difficult political challenges. By the week’s end, Senate Majority Leader Harry Reid had garnered the 60 votes needed to move the measure to floor debate. But much of the coverage still talked about daunting political obstacles to passage. “As the Democrats succeeded Saturday in uniting their caucus by winning over the last two holdouts, big disagreements remained, making final approval of the bill far from certain,” noted a November 22 New York Times story. Rivaling health care, the economy was the No. 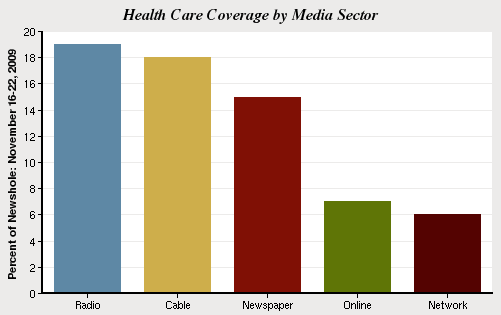 1 story last week in two sectors, newspapers (19%) and online (14%). The leading storyline, accounting for about one quarter of all the coverage, was the jobs situation—and the news there was a mixed bag. At the same time the media were reporting about drops in unemployment claims, other data showed that joblessness rose in 29 states the previous month. The second-biggest storyline involved a debate over how successful the administration’s stimulus package had been in creating jobs. The week’s fourth-biggest story, the furor over the new mammography recommendations, was also the No. 1 topic in network news, at 15% of the airtime studied. The network news programs traditionally devote significant attention to medical issues and it was a far smaller story on cable news, accounting for only 3% of the newshole last week. The guidelines from the U.S. Preventive Services Task Force—released on November 16—triggered so much controversy and confusion that within days, the media narrative had pivoted to the administration distancing itself from the report. The fifth-biggest story last week was President Obama’s trip to Asia and one theme that emerged in the commentary was that style trumped substance. Barack Obama regained his usual position atop the list of lead newsmakers from November 16-22 after two weeks of generating less attention than Fort Hood suspect Nidal Malik Hasan. Last week, Obama was a lead newsmaker—meaning at least 50% of the story referenced him directly—in 9% of the stories studied. The No. 2 newsmaker was Sarah Palin (6%) as she made the media rounds in conjunction with the book release. Next came Hasan, (2%), whose coverage dropped dramatically from the previous week (10%). 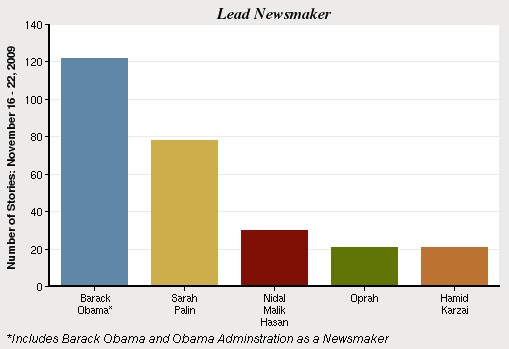 The fourth-leading newsmaker was Oprah Winfrey (2%). Early in the week, she attracted attention for her interview with Palin. But by the end of the week, the big news was about her—Oprah’s announcement that she would be leaving her popular TV talk show in 2011. Tied with her was Afghanistan President Hamid Karzai, (also at 2%) who was inaugurated last week after a contested and perhaps corrupt presidential election. The week’s fifth-leading newsmaker (1%) was Attorney General Eric Holder who made news defending his much-debated decision to try alleged 9/11 mastermind Khalid Sheikh Mohammed and four other terror suspects in a civilian court in New York.